Home » Book Reviews on the Bible and Christianity » Whose Religion is Christianity? Lamin Senneh, Whose Religion is Christianity? : The Gospel Beyond the West, Wm. B. Eerdmans Publishing Company, 2003, ISBN 0802821642. What is the difference between Post-American Christianity and a Post-Christian America? Is global Christianity comparable with Christendom? Furthermore, is the African church a sign of indigenous peoples discovery of Christ, or rather the Christian discovery of indigenous peoples? Who does Christianity belong to? At the time of writing, Brandon Lamar Jackson was a religion major at Morehouse College and a 2005-2006 Martin Luther King Jr. Scholar. 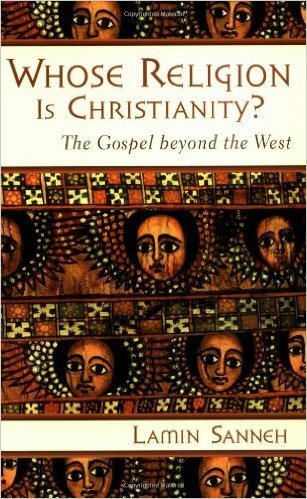 In Dr. Lamin Senneh’s new book, “Whose Religion is Christianity? The Gospel beyond the West.” he seeks to answer these involved questions. In the long first chapter, Senneh, a native of Gambia and professor at Yale Divinity School, provides a view into the growing Christian Churches of Africa, and China, thus showing the religion as a fluid and universal institution, available to everyone, regardless of language or socio-economic status. Professor Senneh, uses a unique question and answer style to “interact with the reader”, in dialectical rather than lecture form (11). This way, students hurl questions at the erudite professor on issues ranging from missionary involvement, to “What brought about the demise of World Christianity in the first place?” (23). At times, the structure of the book may confuse the reader, as you may find yourself lost in the “tennis match” of ideas. In the end however, this dialectical method gives Senneh’s ideas strength, and this because the dialectical criticism provides maximum clarity of his thought. In chapter two, Dr. Senneh answers the question of why Christianity has bombarded Africa and Asia, providing that mother tongues—native language, as a means of translating the Gospel were the catalyst for such change. The importance of mother tongue translation is found in the fact that “the New Testament Gospels are a translated version of the message of Jesus, and that means Christianity is a translated religion without a revealed language.” (97). Upon this, Senneh shows translation as a benchmark of the Christian Church, and thus establishes the importance of further translation to include catholicity of cultures that Christianity now confronts. He further involves the reader in discussion on the importance of mother tongue translation of the Bible, citing interesting facts such as the Bible adopted into its canon the indigenous names for God. Rather than having a faith dictated to them, Africans with translated scripture have a sense of pride—a sentiment born from the notion that God cares about them so much, he can speak to them in their own language. Senneh and his students then struggle with the implications of translating the Bible in the twenty-first century. They discuss the hermeneutical difficulty of translating scripture to a culture vastly different from that is familiar to us. Whose Religion is Christianity, is indispensable reading for those concerned with what God is doing on the Global front. Drawing on issues of world missions, culture and Bible translation, Lamin Senneh embraces the ecumenical church, and encourages the reader to do the same. Although the topic is too comprehensive to cover in one paperback, Senneh does a good job of hastening “the discussion along without being precipitous or evasive (11). I’m confident that if those who read it can make it through the flux of intelligent, but tangled questions, they will find Senneh’s book enjoyable and thought provoking..